Dr. Kate Sacco has worked at Performance Physical Therapy since 2018 as a physical therapist. She has a bachelor’s degree in Athletic Training from Colby-Sawyer College and a Doctorate of Physical Therapy from The University of Rhode Island. While at URI, Dr. Sacco traveled to Guatemala to volunteer in a clinic for children with disabilities. 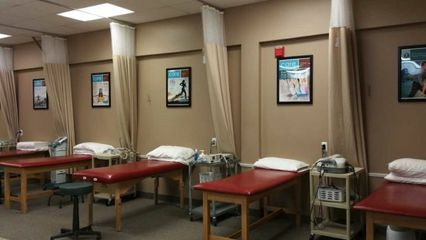 Dr. Sacco is functional dry needling certified and has training in vestibular rehabilitation and IASTM/Graston. She is a certified athletic trainer. Dr. Nicole Coogan, DPT, joined Performance Physical Therapy in 2017 as a physical therapist at our East Greenwich location. Dr. Coogan earned her bachelor’s degree in Exercise Science and Kinesiology from the University of Rhode Island and a Doctorate of Physical Therapy from Franklin Pierce University. After getting her DPT, Dr. Coogan traveled for two years, working as a physical therapist in a wide variety of settings. During that time, she also earned a certification in functional dry needling and the LSVT BIG program - a research-backed protocol for working with patients who have Parkinson’s disease. Dr. Coogan has expertise in general orthopedics as well as geriatrics and Parkinson’s.